What else can you get? 100% satisfaction guaranteed, great customer service provided. Free replacement or refund promised if there is any quality issue. ALPHA CAMP PADDED PLUSH MOON CHAIR WILL PROVIDE FOR YOU COMFORT ANYWHERE! 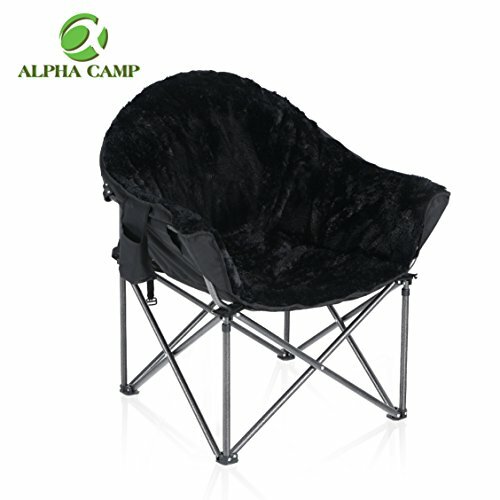 ALPHA CAMP plush moon chair was designed to be compact enough to be used indoors, or bring it to outdoor activities such as picnic, camping, backpacking and terrace parties. The sturdy steel frame creates the perfect balance between comfort and functionality. Great for camping and sporting events, or take it indoors - the well-padded Moon Chair will provide for you comfort anywhere! Open size: 35.4" x 31.5" x 35.4"
Folding size: 35.43" x 25.98" x 38.19"
As an outstanding outdoor brand in the business for more than 15 years. Alpha Camp is now focusing on developing its own brand with years of experiences and professional insights. Meanwhile, Alpha Camp is dedicated to provide its clients with an amazing experience of outdoor life with excellent product and after sales services. "Customer First" is always in mind. High quality gears are raising under the name of Alpha Camp includes tent, patio lanterns, hammocks etc. View More In Folding Tables & Chairs. If you have any questions about this product by ALPHA CAMP, contact us by completing and submitting the form below. If you are looking for a specif part number, please include it with your message.